Wilton Sugar Sheets! and Punch. Cut. Decorate! Today is the day! I get to tell you all about the new Wilton product line being released next month! The newest thing for Wilton is Punch. Cut. Decorate! featuring a new product called Sugar Sheets! 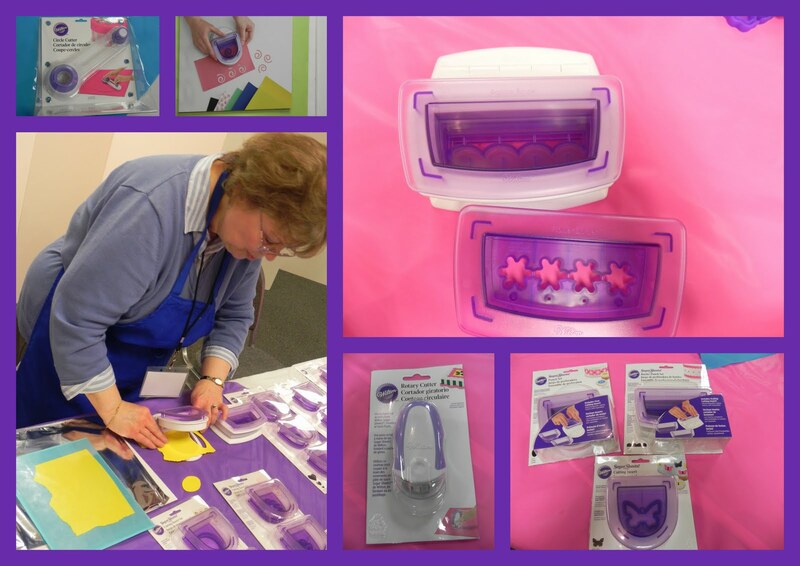 Along with a great line of punches and cutters it makes for a whole new way to decorate cakes, cupcakes and other treats! Sugar Sheets! are a exactly what they sound like, thin sheets of sugar that you can cut and create designs with. They come individually packaged in an airtight resealable envelope and are bendable and pliable. This allows to you cut out your design and then either position it on your cake or form it to hold a shape. When exposed to air the sheet starts to dry. If you make a flower, you can set it in a flower former or cup to dry and it will hold that slightly rounded shape. You can also fold or crease the Sugar Sheets! to create things like fans, ruffles and butterflies. One of my favorite things to do with it was to form three dimensional flowers! When I was at the Wilton creative offices last week they were very excited to tell us all about their new product line. Eric Erwin, Executive Vice President of Marketing and Product Development, told us about Sugar Sheets and why they were developed. Sugar Sheets! cross the world of cake decorating that Wilton with the popular craft of scrapbooking. By utilizing the punches and cutting tools you can create borders and embellishments, much like scrapbooking. It also allows for a new phenomenon of sorts, of cake decorating. You can plan out your design, create your individual embellishments and tweak all of the little elements prior to ever placing it on the cake! Punch. Cut. Decorate! Steve Rocco, Senior Director of Cake and Visual Design, told us about the great ideas for Sugar Sheets that Wilton is developing to be ready for the release date in May. For the first time this line of products have a QR code on them. When scanned with a smart phone it brings you to the Wilton Punch. Cut. Decorate! website with hundreds of product ideas, decorating techniques for the Punch. Cut. Decorate! tools and product information. Did you see that? HUNDREDS of ideas for FREE! Here are some of the projects we got to see using Sugar Sheets! and Punch. Cut. Decorate! The Punch. Cut. Decorate! tools include a single punch, a border punch, interchangeable plates, a circle cutter, a rotary cutter and tweezers. We got to try out all of these items to create our own cake. In less than an hour I created this! I loved using the quilling tool to create the scrolls on the top. I adore the damask patterned Sugar Sheets! And I really loved playing with the punches to create the border, and then layering the single punches to create the embellishments. It was so much fun, and incredibly easy to do! Here are all of the projects that the moms at the Wilton reTreat created. Remember, this was the FIRST TIME any of us had touched the product. I think they came out amazing! Things I love about the Punch. Cut. Decorate! line? I love that they sell the sheets individually so that you can choose exactly how much or how little you will need for a project. The suggested price point is $4 a sheet, so it is reasonable enough to buy a sheet to just try it out. I loved the taste of the product. It has a rich sugary taste that reminded me a lot of buttercream, as opposed to a royal icing sort of flavor that I thought it would have. There are also sugar sheets of letters and numbers as well. Super easy way to add lettering to a cake! I also really loved the punches and tools. They are made of food safe products, which as a mom I really like. 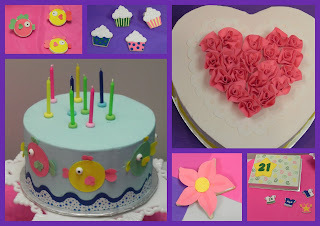 They can be used with Sugar Sheets!, but also can be used with fondant and gum paste. I think they lived up to the tag line, “We make is easy…You make it amazing!”. The other moms and I created this cake with fondant and the Punch. Cut. Decorate! tools. Incredibly easy to use, and made in about an hour with the six of us! Check back Monday for a review of the product with items I’ll be making here at home, and a GIVEAWAY! No monetary compensation was received in return for this post. My trip, including airfare and accommodations were paid for by Wilton. All opinions expressed are my own. Wow. That is amazing! 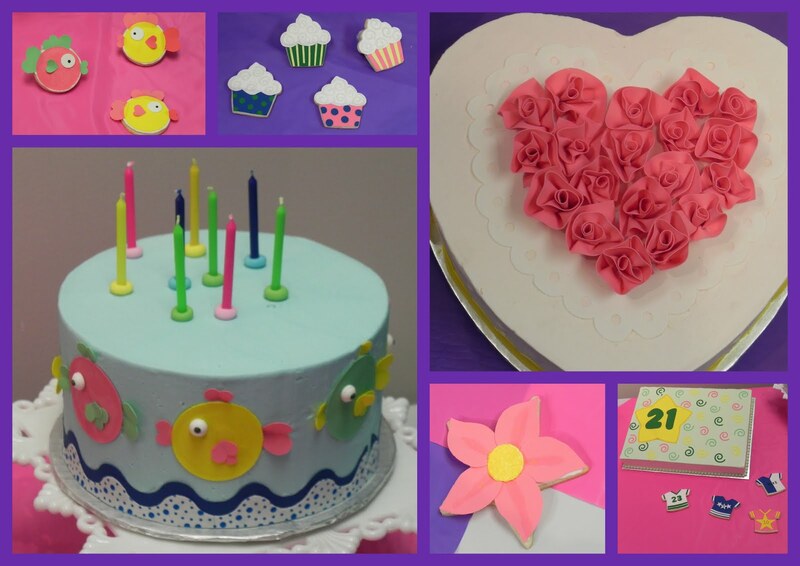 It's like if scrapbooking and cake decorating had a baby!!! I can't wait to try it!!!!!!! Looks like so much fun 🙂 Are those punches and borders continuous or do you have to piece small parts together? Wow, how gorgeous! I can't wait to get some and try them out to beautify our baked goods! I LOVE this idea…but cannot find these in Chicago. Also, your kids are adorable!! !